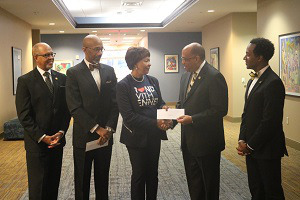 Bennett College has received a $31,000 donation from Alpha Phi Alpha Fraternity, Inc., the country’s oldest African-American fraternity, to support its journey of raising at least $5 million by Feb. 1. In addition to the donation, “Alpha men around the world are going to make contributions” to the college, said Dr. Everett B. Ward, the president of the Fraternity, who handed the gift to Bennett president Dr. Phyllis Worthy Dawkins last week. In December 2018, the women’s only college was removed from the Southern Association of Colleges and Schools Commission on Colleges, solely for its financial problems. Bennett appealed the decision immediately after being removed and continues to be accredited during the appeal process, according to a Bennett release. Dr. Everett B. Ward hands Dr. Phyllis Worthy Dawkins a check in support of Bennett College. Ward, who is St. Augustine’s University’s president, said after the ceremony that he hopes other Greek life organizations will also support Bennett. “All of our organizations are dedicated to preserving scholarship and ensuring the intelligence of the world is preserved through institutions like Bennett College,” he said. Dawkins said that she is grateful for the support.